Spring 2019 WAS Meeting - Participate in Archaeological Investigations! Please join the Horicon Historical Society and the Wisconsin Archeological Society as we conduct an "open-to- the public" archaeological excavation of the backyard of the Historic Satterlee Clark House in Horicon WI. Please join the Horicon Historical Society and the Wisconsin Archeological Society as we conduct an "open-to- the public" archaeological excavation of the backyard of the Historic Satterlee Clark House in Horicon WI. This event encourages children and adults of all ages to come out and help us excavate a few archaeological features on the property. The Wisconsin Archeology Society Awards Committee is pleased to invite applications from avocational archaeologists and archaeology students for the 2019 WASRA grants. Speaker: Seth Schneider, Ph.D., Project Manager, UWM Cultural Resource Management, University of Wisconsin-Milwaukee. Ticket price includes admission and a dinner buffet for the annual WAS Winter Dinner event on Saturday January 19th, 2018 at the Milwaukee Beer Bistro, located at 2370 N. Humboldt Blvd. Milwaukee, WI 53212. Social hour begins at 5:00 pm with cash bar, appetizers, and coffee. Buffet dinner with salads, vegetables, starches and four entrees begins around 6:00 pm. Speaker: Katherine Mary Sterner, Ph.D., Cultural Resource Management Services, University of Wisconsin-Milwaukee, Milwaukee, Wisconsin. About: The Early and Middle Woodland periods of southeastern Wisconsin (500 BCE to 500 CE) saw the dawn of Wisconsin’s agricultural tradition, the rise of burial mound ceremony, and sweeping changes in trade and religion. Join archaeologist Jennifer Haas as she explores new perspectives on these enigmatic and often neglected periods of Wisconsin’s deep history. Please join us for the final Three Rivers Archaeological Society program for 2018. We're pleased to welcome Dr. Scott Palumbo of the College of Lake County as our guest speaker. The public is welcome. Admission is free. Please see below for details. The AIA Milwaukee Society will be hosting a lecture this Sunday at 3pm. Dr. Eric Cline will present "1177 BC: The Year Civilization Collapsed” at the yearly Norton Lecture. The lecture will be hosted in Sabin Hall, Room G90, 3413 N. Downer Ave. Milwaukee, WI 53211. The Fall 2018 meeting of the Wisconsin Archeological Society is dedicated to ancient technologies used by peoples to prepare for the harsh winters of Wisconsin 1000 years ago. Please join us for pottery making and stone tool making with some hands-on opportunities to participate! We will also be digging and preparing an underground pit for food storage. About: Join archaeologist and author Robert Boszhardt of Driftless Pathways as he takes us on a journey through the archaeology of the Driftless Area, from the hidden rock art of Tainter Cave, to the ancient stone quarries at Silver Mound, to state-of-the-art mound-hunting technology. Date: Tuesday, October 9, 2018, 7:00 p.m.
Abstract: Theories concerning the end of effigy mound building have centered around scenarios of uniform culture change, invasion, or mass emigration. A review of late Effigy Mound complex sites suggests that different effigy-building Late Woodland communities may have reacted to the appearance of Cahokians in Wisconsin in different ways, creating a short burst of diversity and complexity in material culture and social networks before lifeways re-converged on a new pattern that we term ‘Oneota’. LiDAR imagery, in particular, is shedding new light on Late Woodland settlement and ceremonial systems in southwestern Grant County, raising the possibility that one of Wisconsin’s best known site-unit-intrusion villages is more home-grown than previously thought. About: Coinciding with the dawn of the Middle Mississippian Culture at the ancient city of Cahokia nearly 1,000 years ago, a group canoed over 500 miles up the Mississippi River to establish a settlement at Trempealeau, Wisconsin. Antiquarian records alluded to distinct platform mounds and exotic ceramics, but only recently has the age, extent, and purpose of Trempealeau’s very early Mississippian expression been thoroughly explored. Ongoing excavations since 2010 have revealed that the Cahokians carried ceramic vessels and a variety of flint stones from their homeland along with their architecture and religion to this far-flung yet short-lived outpost; and why they came to Trempealeau. Date: Thursday, September 13, 2018, 7:00 p.m.
About: A severe windstorm in 2001 toppled a large cottonwood in Lake Winneconne County Park (now Lake Winneconne Park) in the Village of Winneconne. This event exposed a previously unreported archaeological site. In addition to the expected shell-tempered Lake Winnebago Trailed Oneota pottery and associated materials, eight small rolled metal beads made of European smelted copper kettles were recovered from water screen residues. These beads, which could date from the Protohistoric through Middle Historic Period, could represent the long-sought historic Oneota Horizon and linkage with the Winnebago (Ho-Chunk). Unfortunately, the disturbed context of the tree tip prevented the documentation of a firm association between Oneota ceramics and European-source metal. In 2017 the UW-Oshkosh Archaeology Field School investigated the Park. Shovel testing determined the extent and boundaries of the site. A 4m x 4m excavation block was placed close to the location of the 2001 tree tip. Half of the units (in a checkerboard pattern) were dry screened in the field through 1/4-inch mesh. The intact deposits from the remaining 8 units were water screened through 1/16 inch mesh in order to recover a wider range of materials, including small metal beads and other trade items..
Excavations and subsequent inventorying of the large number of samples from the 2017 field work demonstrated the expected presence of a multi-component site, with Late Archaic through Oneota occupations confirmed. While no additional historic Fur Trade Era artifacts were identified, several likely, but previously unrecognized historic Native American potter sherd have been identified. The dating and specific ethnographic assignment of these ceramics remain in question. Date: Tuesday, September 11, 2018, 7:00 p.m.
About: The Pope site was discovered by Paul Pope in 1971 when he plowed up a small concentration of thermally fractured points. The numerous thermally fractured points were initially identified as Scottsbluff. Because some bones found with the point fragments were initially identified as human the site was identified as a human cremation burial and compared to the Renier site from the Door Peninsula portion of Brown County. Based on the perceived similarity of Renier, Pope, and other sites, the Renier Ceremonial Complex (RCC) has been recently proposed. Limited test excavations centered on the location of the fire feature in April 2018 recovered additional artifactual material and has substantially clarified the nature of the Pope site. The ritual nature of the Pope site fire feature is confirmed, but its specific role, and the validity of the RCC is called into question. Reanalysis of the Pope site points has resulted in their reclassification as Hardin Barbed. This has significant implications for understanding the interaction of the diverse and dispersed Early Holocene populations of hunter-gatherers in the Upper Midwest. This is the first of nine scheduled monthly meeting and program for the 2018-2019 meeting year of the Robert Ritzenthaler Society’s meeting year. Monthly meetings and programs are generally scheduled for the second Tuesday of the month from September through May. All programs sponsored by the Ritzenthaler Society are free and open to the public. Please extend an invitation to attend to your friends. Book Sale: The sale of books, reports, journal issues, and magazine will continue. Thanks to all who have donated books, magazines, and academic journals to this ongoing sale. The proceeds of the sale go to the Ritzenthaler Archaeological Society’s treasury. Archaeology Month Posters and Bookmarks: The remaining posters (a shipwreck) and bookmarks (an eared Scottsbluff) celebrating Wisconsin’s Archaeology Month (May 2018) will be available for pick-up at the September Meeting. Building Location: Harrington Hall is located on the west side of the T-intersection of John with Elmwood on the east side of the UW-Oshkosh campus. Parking: We have permission to use UW-Oshkosh Lot 34 from one half hour before until one half hour after our meetings. This is the lot east of Elmwood and south of John – the one we regularly use for the meetings in Harrington Hall. We have access from 6:30 pm to 10:30 pm. If you park in the lot before 6:30 pm (even just for a few minutes) you are very likely to get a parking ticket. Remember that you must park within the lines of the parking stall, with the rear of the vehicle toward the aisle. We do not have permission to use any other parking lot. You will get a ticket if you park in any other lot. You may also be able to find parking on John Street or Scott Avenue. Handicap Access: Ground level access to Harrington is available at the southern entrance to Harrington. An elevator is available in the south end of the building. There is no parking next to the building. You can make arrangements to be dropped off at the south side of the building. 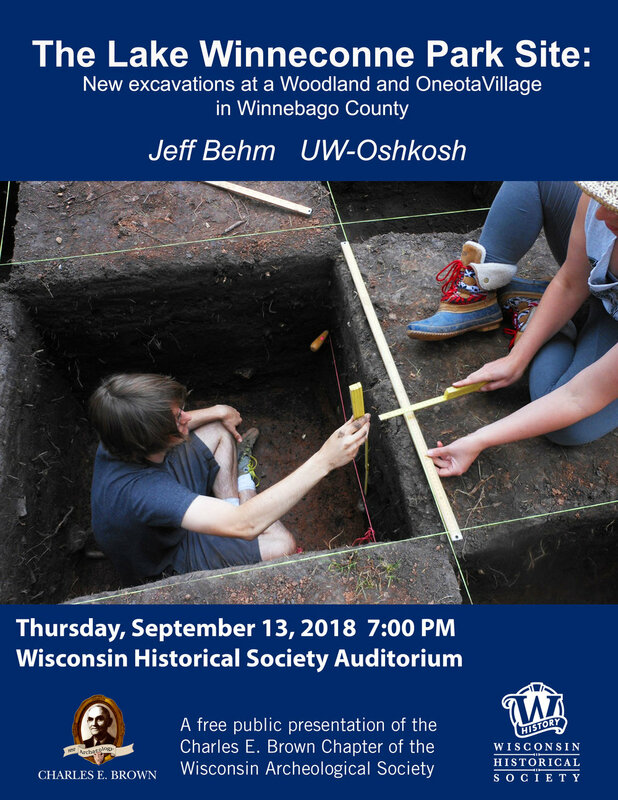 Date: Monday, September 10, 2018, 7:00 p.m.
About: In 2006, Beloit College students, faculty, and staff and community volunteers exposed and excavated part of an 1840s-1850s house site at the parking lot behind the college's Guest House. The house belonged to Minerva B. Fuller and was home to Minerva, her son Charles, and a Norwegian immigrant young woman named Julia. We recently discovered that Minerva was the sister of Beloit College founder Stephen Peet: her full name was Minerva Beulah Peet Fuller. 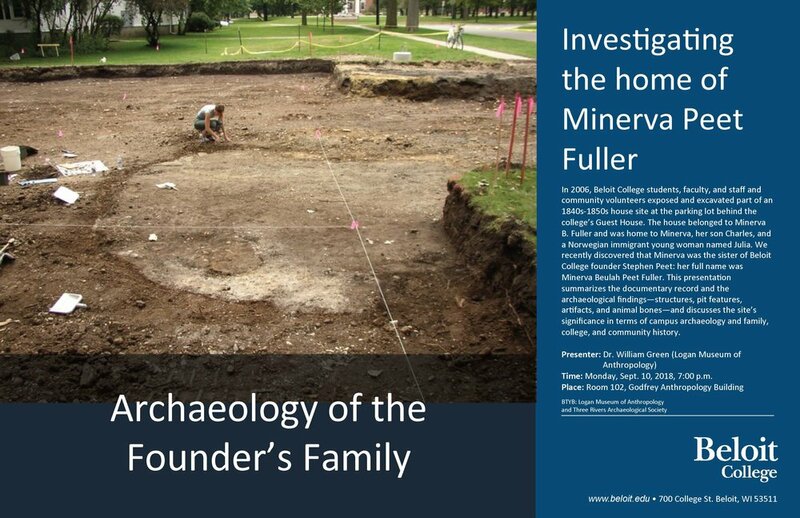 This presentation summarizes the documentary record and the archaeological findings - structures, pit features, artifacts, and animal bones - and discusses the site's significance in terms of campus archaeology and family, college, and community history. Under the guidance of professional archaeologist you can help excavate and screen for potential historic and prehistoric features and artifacts buried on the Clark House Backyard lawn. Satterlee Clark was the Sutler of Fort Winnebago in the 1830's and came over to Horicon to establish a trading post and then eventual home by 1855. His house is located on the high ground overlooking the mouth of the Horicon Marsh where the Rock River Flows to the south and beyond. Previous yard work construction to build a stone slab walkway and shovel probe tests relieved large areas of early historic period garbage middens and potentially intact archaeological features. Also that day: The Historic 1855 Satterlee Clark House and the rebuilt Historic Hustisford one-room-school house will be open to the public for tours. There is a large prehistoric archaeological artifact collection located and displayed in the adjacent one-room-school house which highlights Dodge County's prehistoric past. This event is free and will run from 10:00 AM - 4:00 PM on Saturday, May 19th, 2018. If it is raining that day the event will be cancelled and possibly reschedule at a near future date. For any additional information or questions please contact event organizer Kurt A. Sampson at 414-405-4367 or by email at kurtsampson68@gmail.com. Date: Monday, May 14, 2018, 7:00 p.m.
About: Wisconsin’s Late Woodland residents built thousands of earthen burial mounds in the form of animals, spirits, and people between AD 700-1200. Today, new technology and review of old excavations combine to give us a more complete understanding of Wisconsin’s enigmatic effigy mound-builders and their eventual fate. Abstract: Ongoing excavations of the Middle Grant Creek (MGC) site at Midewin National Tallgrass Prairie in Northern Illinois are expanding our understandings of lifeways during the final period before European arrival. This well-preserved site is one of the only single component protohistoric sites remaining in Northern Illinois and is providing researchers a unique glimpse into protohistoric communities. In this presentation, Dr. McLeester will discuss the artifact assemblage, including unexpected finds such as marine shell and painted pottery, indicative of far flung trade relationships. She will also discuss her use of new drone based thermal imaging and historical image analysis to locate previously unknown features and expand existing site limits. Throughout the presentation, Dr. McLeester will discuss how this public archaeological project is exposing the richness and complexity of late prehistoric communities and reshaping our ideas of the period just prior to European colonialism. We are going to be having a work day at the Wisconsin Archeological Society's Heim Mound site on this coming Sunday afternoon from noon to 4 pm. Our focus will be the removal of periwinkle (vinca minor) and pachysandra, two non-native and invasive ground covers which are over-running the property and choking out the native wildflowers. Along the way, we will also be discussing the plans for future care for the property.